Like most of you, I am sick about the terrible fires in California, just as I am about the recent hurricane disasters in the South. I feel so sorry for the countless thousands of people forced from their homes, many of which are now gone. The death toll continues to rise in Paradise, California, where the Camp Fire is the deadliest and most destructive in the state’s history. And, after burning 146,000 acres, it’s still only 50% contained! I know Paradise well, having lived just south of there for 15 years in Grass Valley and Nevada City. In college, I fought fires in the area during my college summer breaks. I know how dry it is this time of year. I know that even though a tree may look normal, its fuel moisture may be so low that it will burn exactly like it were dead. The dry grasses, nature’s perfect kindling, burn like paper. Put all that prime fuel together with strong winds, add a spark and it’s a perfect storm for unimaginable devastation. The terrain in the Malibu area of Southern California is just as dry, and just as vulnerable. At least a dozen subscribers of this newsletter live in Paradise, where 9,700 homes have been destroyed, not to mention at least 71 lives lost. I pray that most of those still missing are found alive. The mayor of Paradise, Jody Jones, is living in her motorhome in a vacant lot in nearby Chico. MANY YEARS AGO, I wrote a story about recovery efforts in Coalinga, California, after it was devastated by an earthquake. I remember seeing RVs in front of one home after another — temporary shelters for displaced residents while they rebuilt. I wonder, with all the present-day disasters — fires, hurricanes, tornadoes — if some of the people who lost their homes will just forget about rebuilding and buy an RV. Face it, a modern-day fifth wheel trailer or motorhome is just as comfortable as a home or condo, and they come equipped with a bed, furniture and kitchen appliances! If a disaster is on the way an RV can be towed or driven from harm’s way. I am planning a trip to Southern California next month in my motorhome and hope to visit Paradise on the way to talk to some of the RVers there. I know from news reports and emails I’ve received that at least some were able to escape quickly with their rigs. I also know that others, with dead batteries or other mobility issues, could not be moved fast enough and went up in flames. Their owners are now in shelters, hotels, or with friends and family. A sea of tents surrounds the Walmart in Chico, which on Friday announced everyone must leave. (UPDATE: According to actionnewsnow.com, the Chico City Manager stated: “There is no deadline or demand from the city that anyone vacate the unofficial shelter that’s formed at the Walmart in Chico.”) If you know anyone in Paradise, you can see if they’re “on the list” of 1,011 missing persons. This disaster should be a reminder to all of us with RVs to have them ready to go at a moment’s notice. No matter where you live, a disaster could come out of nowhere. Be prepared. Finally, on a lighter note, Happy Thanksgiving! I hope you are fortunate enough to spend the day with family and friends. Cherish them all, especially your parents if you are fortunate enough to still have them! And, perhaps as you sit comfortably around your dinner table, say a prayer for all those among us who no longer have one. RVtravel.com will debut its new and improved website this coming Tuesday, November 20. Because we will be busy all week getting it launched, we’ll take a break from publishing our newsletters. So there will be no new issues of RV Daily Tips next Monday through Thursday; we will return to our normal weekday schedule the following Monday, November 26. The RVtravel.com website will remain up and running, although beginning late Tuesday it will sport its brand-new look. We’ll keep you updated on our progress on our Facebook page. Those of you who get an afternoon RSS alert of all the stories we published in the past 24 hours will not receive those either this coming week. 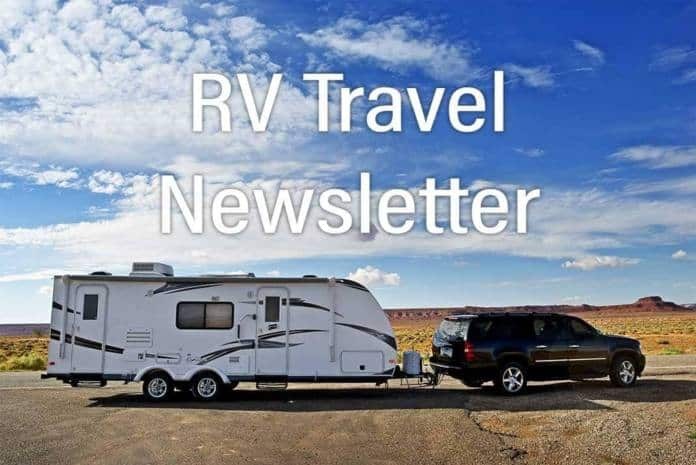 Our Newest Newsletter: We published the first issue of our new monthly newsletter, “Beginner’s Guide to RVing,” yesterday (Nov. 16). If you are not already signed up, you can read the issue here (and/or sign up to receive an email alert for each new issue). I just had the opportunity to write about something I’ve never previously discussed in any RVtravel article – but I believe it’s vitally important for any RV owner who camps in areas with questionable electrical power. Here’s the situation: What if you’re camping in Mexico or somewhere in the USA where campground pedestals may have reversed polarity and a missing ground connection? While your Intelligent/EMS surge protector should warn you about the missing ground, all they’ll do is shut down the power. And there you sit, without any electricity. But what if there were two very affordable products that you don’t normally need, but could be real lifesavers in any campground with an antique/ungrounded electrical system? Well, there are, and they will allow you to power your RV from an ungrounded 20- or 30-amp outlet on a pedestal with complete safety. And yes, this is an NEC-approved fix that I’m applying to this otherwise deadly scenario. Interested? Then click here to learn more. •A special members-only edition of this weekly newsletter with premium content and minimal advertising. Become a member. The staff of RVtravel.com works hard to bring you this honest, unbiased, valuable newsletter every week. Readers help make it possible with their “voluntary subscriptions.” Even a pledge of $5, $10 or $20 a year is appreciated — that’s for more than 50 weekly issues (add another 230 issues if you read our RV Daily Tips and other newsletters)! Many readers set up an ongoing subscription, most $5 to $10 a month. But even a one-time contribution of $5 or $10 helps make it possible for us to write about important matters, not just fluff to please advertisers and RV industry big shots. Enter a voluntary subscription. Use a credit card, PayPal or mail a check. Alan Warren from the radio program The RV Show USA talks with RV lemon law attorney Ron Burdge who explains nine little-known words RV buyers should insist are handwritten on their contracts when buying an RV from a dealer. Doing it could save them thousands of dollars and heartache later. Click here to watch the four-minute video. • Burglars damage dozens of RVs in thefts at dealerships in Colorado. • Michigan man charged with arson for setting mobile home and RV on fire. • Missouri State Parks announces camping discount for military. • Hurricane Florence victims receive FEMA trailers – but no keys. • Oregon couple loses uninsured motorhome and possessions in RV fire. • Motorhome parking restrictions change for Hurricane Michael victims. • Firefighters extinguish RV fire on UC Berkeley’s frat row. • Nearly a dozen RVs burn at Tucson storage lot. • Driver of motorhome arrested for DUI after serious crash in Florida. • RVDA board passes the torch to its new slate of officers. • Thor recalls 1,384 motorhomes: propane hose issue. • Grand Design fifth wheels recalled for electrical short risk. • Heartland recalls trailers: Wrong propane hose installed. • Thor recalls motorhomes: some lights could fail. • Forest River recalls trailers: Awning arm could detach. On Thursday, Nov. 8, RVers Jane Latham and Ed Van Der Linden were trying to escape from the flames in Northern California, but they were soon rescuing Paradise residents on foot trying to flee the horrific onslaught of the fire that devastated their town and took lives. Read more. A 47-year-old Naples man died Sunday in a one-vehicle accident on Interstate 4. Florida Highway Patrol investigators say Jon MacDonough died at the scene after the RV he was driving had a tire blow out, left the road, hit a light pole and overturned onto its left side. Please watch this important video about what to do if the RV (or other vehicle) you are driving blows a tire. What you learn could save your life. One million Americans live in their RVs, says The Washington Post in an article last week about the “modern nomads.” The Post profiles some of these nomads, and what drove them to abandon their stick homes and become RV “fulltimers.” Read more. Where will you spend Thanksgiving Day? We had warm weather on our minds this past week. Have you reserved campsites for summer 2019 yet? Nope. The tires on your RV are fairly new. You’re probably not heading south this winter, but that may be because you already live south (and in warm weather). You have one AC in your RV, but some of you have three. Sometimes you lock your RV when you take walks, sometimes you don’t. And you’re pretty satisfied with your Winnebago View. All this and more, right here. A first-of-its-kind study released recently by The Pew Charitable Trusts and several national sporting groups found that hunting and other wildlife-related recreation on tracts managed by the Bureau of Land Management has a significant economic impact on nearby communities and that these benefits should be considered in land use decisions. Learn more. When the Alleghany County Zoning Board in Covington, Virginia, decided to change the rules on where and how RV owners could park their rigs on their mountain vacation properties, they weren’t quite prepared for the backlash from local residents. Learn more. 2018 RV Warranty prices won’t last! NOW is the best time to protect yourself from the rising cost of RV repairs with a reliable RV Warranty from BBB A+ Provider. Pricing and Eligibility changes hit January 1st, 2019, so don’t wait! Get a FREE Quote for Top-Rated RV Warranty Coverage today, and head into the holidays with peace of mind. Rain, rain go away … and never come back so often! Rich “The Wanderman” hasn’t had a day off in five months that hasn’t rained (in the Northeast). He is disheartened (to put it mildly) because maintenance tasks around the house and RV have gotten pushed back over and over again because of it. (He wishes he could send some of that rain to California!) Read more. Designers have gone bonkers in recent years with slideouts – some practical and some over-the-top. Here is a new concept motorhome by Lippert Components that takes slides to another level: a Class C with a single fold-out and four slideouts of all styles and sizes which include an expanding wine bar, a flip-out dog tent and a fully expanding living room. Check it out. As local and state budgets tighten, officials look for ways to refill the coffers. One way to do this is to replace low return land uses with higher yield options, like this shift in focus in a rural Utah county. And though the focus here is on glamping, if the idea works, could it mean replacing grazing lands with regular campgrounds and adding much-needed campsites for RV travelers? Learn more. 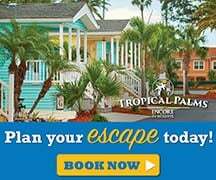 Tropical Palms is a hidden gem on 69 beautiful sun-kissed acres perfect for your Orlando vacation. We’re approximately 4 miles from Walt Disney World Resort, 11 miles from the Orange County Convention Center and within walking distance of Old Town and Fun Spot. Our convenient location and affordable prices provide the perfect RV resort to enjoy all Central Florida offers. Click here to learn more. • A real shocker about campground electricity. • RV and RV-related recalls for October 2018. • Announcements from the editor, Nov. 10, 2018. • One reason Consumer Reports doesn’t rate RVs. • What we learned about you last week (November 3-9). SAVE $$$! Until now, the standard for heating RVs of all types has been to use bottled propane (LPG). With CheapHeat™ there’s a better option. Now, with the flip of a switch, you can change the central heating system between gas and electric. When you run on electric heat rather than gas, your coach will be heated by the electricity provided by the RV park. Learn more. We received a question from Canadian John Blaicher via our Facebook group RV Advice. It’s a topic that we’ve not seen before. Do you have any advice for him? Read John’s question, and comment here. Has anyone had experience finding parts for a Dometic refrigerator with a removable freezer compartment? If so, where can they be found? The only ones we’ve found (shelf, door, hinge, and spring) cost almost as much as a new refrigerator. Comment here. Then you need Americas Mailbox! You’ll enjoy great tax advantages with your South Dakota “residency,” like no state income tax and low insurance rates. Many plans are available. Click the video where RV Travel editor Chuck Woodbury talks with Americas Mailbox owner Don Humes. Or click here to learn more or enroll. Come shop with us for the holidays! 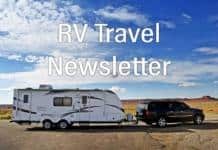 Announcing the new RVtravel store! We’ve hand-selected all of our favorite must-have RV items, our famous gift guide, neat kitchen gadgets, pet gear and so much more. Check it out here and get all your holiday shopping out of the way. And remember, all holiday shipping is free! Change from week before: Down 7 cents; Change from year before: Up 9 cents. Change from week before: Down 2 cents; Change from year before: Up 40 cents. Attention Big Rig RV owners! This 2019 edition of the Motor Carriers’ Road Atlas will keep you and your large RV out of trouble. Learn which routes have low bridges, and highways to avoid with length or height limitations. Even if you have a GPS, you will rely on this atlas to keep out of trouble. Great gift. Learn more or order. Karin Reilly shares this fluid tip: “Nearing the border with Canada, we realized we were quite a bit over on the alcohol allowance. Since we were going to be in Canada only two weeks, we didn’t want to pay duty going into Canada and then back into the U.S. I found a cross border storage facility. These facilities receive packages for Canadians and it’s significantly cheaper for them to have goods shipped near the border versus across it. We got a sturdy box at Walmart and filled it with our alcohol and tobacco overages and stuffed a bed sheet around the bottles. We taped it shut with packing tape and marked it with name and cell number. The facility charged FIVE dollars to store our box for two weeks because it weighed less than 60 pounds! What a bargain! Just had to be sure to be there during Monday through Friday business hours as they’re only open one Saturday a month.” Thanks, Karin! Are you tired of hearing a rattling stovetop cover when on the road? Would you like to have more space for food prep? Take care of both issues with Camco’s RV Universal Silent Top Stovetop Cover, a simple and elegant way to optimize your RV kitchen’s counter space while reducing stovetop rattling when on the move. Learn more. The Microfiber Mesh Bug and Tar Sponge has millions of tiny fibers in the microfiber cloth that grabs and holds dust and dirt. It is so effective it even cleans without chemicals, saving time and money. Its secret lies in its unique, double-layer microfiber mesh. Older nylon bug sponges can harm your clear coat but this is paint-safe. Learn more or order. Previous polls: Thor Ace motorhome • Keystone Montana Fifth Wheel • Jayco Jay Flight trailer • Winnebago View. Sooner or later, every RVer comes upon an RV water hookup with pressure so high it could blow out the plumbing, causing costly damage. The solution is to be sure when you hook up to use a water pressure regulator like this one that features a lead-free design to prevent lead contamination. Learn more or order. How do I winterize my ice maker? How do I winterize my ice maker? I have a Norcold refrigerator in a Fleetwood motorhome. —Larry R.
Tired of dull knives? This easy-to-use knife sharpener (used by staff writer, Emily) sharpens your knives with a few quick strokes. You’ll feel like a professional! It has two settings: one for fine blades and another for coarse. Its small size is perfect for an RV, and it’s about $6. Says Gail of RVtravel.com: “Wow! This works great!” Learn more or order here. If you don’t take care of your slideout you’re asking for problems including costly water damage. This Thetford rubber seal lubricant prevents fading, cracking and deterioration. It cleans, conditions and shines, keeping seals flexible and protected from sunlight damage. Also use on door and window seals. The mineral oil product acts as a lubricant. Learn more or order. One of my readers complained about their EMS/smart surge protector shutting down the AC power in the middle of the night “just” because the campground voltage went a little high (132+ volts). Of course, the surge protector was just doing its job, but waking up in the morning without AC power and heating all night gave them reason enough not to plug in their surge protector next time. So how about this as a solution for alerting you of midnight power outages? You can get a power failure night-light for less than $20, and many of them can be used as a flashlight, too. Setting tire pressure on cold days? Question: “I am looking for a formula for adjusting ‘cold inflation’ pressures for large tires. I have read that for smaller (car) tires the recommendation is 1 psi per 10 degrees F. What is also not clear is what the assumed ‘cold’ temperature is. Is it assumed to be 65 F, for example? So if we are sitting at 25 F, what is the adjustment?” Read Roger’s answer. Perfect gift for a desert lover! This fun coaster set is shaped like a cactus and is perfect for a desert lover’s coffee table! The coasters stack together in any shape to form a cactus. The grandkids will love it, and the neighbors next door will want one too! Great gift! Learn more or order. Make an omelette in seconds! Tired of making omelettes and dealing with the timely preparation, mess and cleanup? This handy microwaveable omelette maker saves the day! It makes omelettes in just 3 easy steps: beat eggs and milk, add ingredients, microwave and eat! It promotes healthy eating by cutting out butter, oil and grease. Buy this breakfast-saver here. This salad is always in season. Use leftover chicken or turkey, or just grab a deli roasted chicken on your way to the campground and cut it in bite size pieces. Sneaky shortcut: Buy chicken salad at the deli. Put it in a bowl and lightly fold in apples and stuffing. Now it’s “homemade”. This hearty salad also goes well in tortilla wraps or lettuce wraps. Get the recipe. Fool everyone with this camera lens coffee mug! This cool coffee mug is an exact replica of a Canon camera lens, right down to moveable switches! The stainless steel inside will keep coffee hot and the outside plastic is BPA-free. One reviewer writes that it looks so real she put it in her husband’s camera bag! You’ll want to walk around the campground to show off this one. You can order it here. Ol’ Ben Franklin sure didn’t know what he was talking about when he suggested the wild turkey for our national symbol. He thought it was a proud bird of the forest, while the bald eagle was a lowly scavenger which stole food from other birds. The turkey, he claimed, was more typical of a true American bird than the eagle. Although a few of those points are true, Ol’ Ben didn’t realize just how stupid the turkey is. Read more. This is one of the neatest gadgets we’ve seen lately! The waterproof monocular telescope connects right to your phone, so you can take photos of that bird waaaaay over there. Photograph up to 10x closer than before. Great for sightseeing or spotting distant wildlife. Bring it everywhere. We already bought one! Learn more or order. Both Waze and Google Maps can give you turn-by-turn voice-directed navigation. Waze also adds real-time crowd-sourced road information including traffic, road hazards and police locations. Some folks prefer Waze to Google Maps because Waze gives information about traffic. Hey! So does Google Maps. Find out how to use these handy navigators here. … from Geeks On Tour. Here is a recent webcast: #156, How To Use a Smartphone to Scan and Create PDF Documents. Watch live or archives of past programs. HURRY. JOIN NOW: A new annual membership is going up Jan. 1 from $49 to $79. As a Harvest Hosts member you can stay overnight free at more than 620 wineries, farms, breweries and other attractions! And your $49 annual membership will be grandfathered at the low rate. Learn more. FIVE FINGER CLOSE: A car dealer technique used by some RV dealers to get the sales papers signed by the consumer without the consumer realizing that the numbers on the papers have been increased above what was orally discussed with the consumer. An example is where the RV dealership Finance Manager holds the stack of RV sales documents, such as the sales contract, finance contract, etc., still with one hand planted in the middle of the document while pointing to the signature line with the other hand. He then asks the buyer to just sign here and here and here, etc., thereby using their hand to cover up an area of the sales documents where numbers appear that the RV dealer does not want the buyer to see. NICKEL: Refers to the amount of $500. The only tool you’ll need – perfect for a stocking stuffer! This multifunctional tool is seven in one! This heavy-duty pen tool features a handy tablet or smartphone stylus, a sturdy screwdriver, a bubble level, a universal inch/cm ruler and a handy Phillips screwdriver flathead bit, and it’s only the size of a pen! Perfect for any weekend project, and it even makes a great stocking stuffer. Learn more or order. Let Angry Mama clean your microwave! Is your microwave dirty? It’s hard to scrub off all that crusty gunk! Admit it, when was the last time you scrubbed it clean? Angry Mama, the miracle microwave cleaner, is here to do the dirty job for you! Add water and vinegar (maybe some lemon too) to this feisty lady and watch her steam away the mess. Within minutes your microwave will be sparkling! Click the image to watch a video and click here to learn more. If you use your computer on your lap, read your Kindle on the couch, or have a hard time holding that heavy hard book, you need this lap desk! Staff writer Emily uses this when she works and highly recommends it. It has 8 adjustable levels and a stopper to hold objects upright. Great for those with lower back pain or bad posture. Learn more or order. In Blackfoot, Idaho, you’ll find the Spectacular Spud Museum (also known as the Idaho Potato Museum, though that’s not as fun to say). Located in the old Oregon Short Line Railroad Depot (plenty of RV parking), you’ll learn all about the history of the Idaho potato and potatoes in general (including how potatoes influenced the lives of President Kennedy’s family). And lucky you, can also see the world’s largest potato chip. Visit the museum website. Here’s how to keep warm in your RV without wasting propane to run your heater. Just snuggle up with a warming blanket! This one operates on 12-volt. Stitched from 100-percent polyester fleece, it’s comfortable, functional, safe and gentle on your RV’s battery. Put it on your bed to warm it up before turning in! Learn more or order from Amazon. 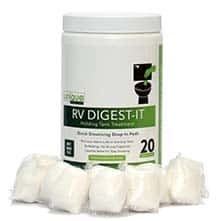 Endorsed by RV tire expert Roger Marble! The Accutire MS-4021B digital tire pressure gauge has an easy-to-read LCD display that provides pressure readings from 5-150 PSI. It’s ergonomically designed with an angled head and a rubber-coated easy-grip handle. If you forget to turn off the gauge it will automatically shut off. The included lithium battery never needs to be recharged or replaced. And it’s only about $12. Learn more or order. Ben & Jerry learned how to make ice cream by taking a $5 correspondence course offered by Penn State. Park Your Phone Booth! —Thanks to Frank in Montana. I dropped my iPhone yesterday from the 21st floor of my building. Good thing it was in airplane mode. In this issue, clicking on a link to read further does not open a new window. Living in hurricane country, my RV is always ready. Gas, bottled water, MRE’s and personal hygiene items, always there, always ready, during the season. Regarding adding the magical 9 words to actually extend your warranty up to 4 year, be mindful that any contract additions, deletions and modifications require both parties to Initial their name and date it. Can you tell me how. I am looking for a switch for my Aladdin monitoring system and it is no longer available. Where was the storage place near which border crossing. Any further info would be appreciated. Back in the early 60’s when I was stationed at Travis AFB, we volunteered to assist in a large wildfire. Scary to say the least. Nobody knows unless they have been there, how fast a fire can spread. Thanks go out to all the firefighters and volunteers who are putting their lives literally on the line. If you are looking for hard to find parts for your RV. Call the wrecking yards in the now depressed oil field areas. When Oil workers left they left hundreds of RVs. Many types and ages of RV parts available.